Shows delicate aromas and flavors; with a crisp and light bodied personality that comes together to a balanced profile with good acidity and a touch of mature oak. Dry fruits, pear and golden apple are married with the “exotic” flavors of the chardonnay grape variety. 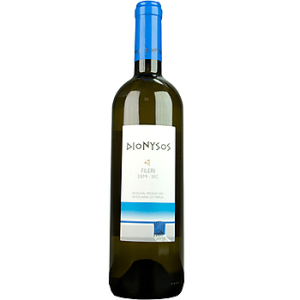 A regional wine of Trifilia – Peloponnese made from 100% Fileri grapes. Smooth and fruity with aromas of spring flowers complemented with orange peel, banana and apple overtones. An excellent companiment with salads, light dishes and seafood fares. The Dionysos Fileri can also be enjoyed on its own or wirth a plate of fruits. 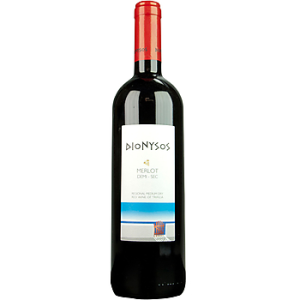 A regional wine of Trifilia – Peloponnese made from 100% Merlot grapes. Bright ruby color with purple hues. Rich, complex and aromatic on the nose. The palate is fruity with notes of cherries and bluberries. A full body red with smooth taste and texture. It is a red wine that can be enjoyed through out the year and with a variety of dishes.